While Chrysler rebounds, tensions in Italy may make it difficult for CEO Sergio Marchionne to carry out restructuring measures needed to stabilize Fiat, Italy's largest manufacturer. TURIN, Italy (Bloomberg) -- At a rain-sodden charity event in Detroit earlier this month, Mayor Dave Bing and other city leaders showered Chrysler Group CEO Sergio Marchionne with kind words. The warm welcome contrasts sharply with the mood in Marchionne's home country of Italy, where as leader of Fiat he is more likely to be vilified than praised by politicians. "It's time to stop fooling around and face the real situation" at Fiat, Democratic Party leader Pier Luigi Bersani told reporters in Milan on Sept. 24. "We face the dilemma of how to save car production in this country." Two days earlier, Prime Minister Mario Monti had summoned Marchionne to a five-hour meeting at Palazzo Chigi, his official residence. Monti wanted to know why Marchionne had backed off an initiative called Fabbrica Italia. Under that plan, Fiat was to spend 20 billion euros ($26 billion) to boost production in Italy in exchange for labor concessions. Outside the 16th-Century building, dozens of former workers protested, the latest in a series of anti-Marchionne rallies. "I've got two kids and a mortgage. What shall I do? Do I have to steal?," said Domenico Delle Grazie, a demonstrator who was laid off from Fiat Industrial SpA, the truck and tractor manufacturer that Marchionne spun off from Fiat in 2011. The differing perceptions of the 60-year-old executive stem from the performance of the two automakers he leads. After a near-death experience, Chrysler has a successful turnaround behind it, while Fiat is still coming to grips with its woes. The tensions in Italy may make it difficult for Marchionne to carry out restructuring measures needed to stabilize Fiat, Italy's largest manufacturer. With Fiat on track to lose 700 million euros in Europe this year as its market share in the region tumbles, strained relations in Italy could spur Marchionne to spend more time focusing on Chrysler and the United States as he plots a merger of the two carmakers. The latest sign of the shift will be at the Paris auto show, which opens for press previews on Thursday. Fiat is the only major European carmaker not presenting a new model at the region's biggest auto exhibition of the year, and it just delayed the introduction of a revamped Punto hatchback, while Chrysler showed 66 new and existing vehicles at a recent dealers' convention in Las Vegas. "In Michigan and Detroit, Sergio is a rock star," said James Blanchard, a former Michigan governor whose three-year term on Chrysler's board expired in June. Italians assume "he's going to have to do everything possible to produce every last vehicle in Italy. That's not world reality." In a speech to Fiat directors on Tuesday, Marchionne insisted that he has no plans to "abandon" the Italian side of the business despite the time and energy he has spent on Chrysler in recent years. 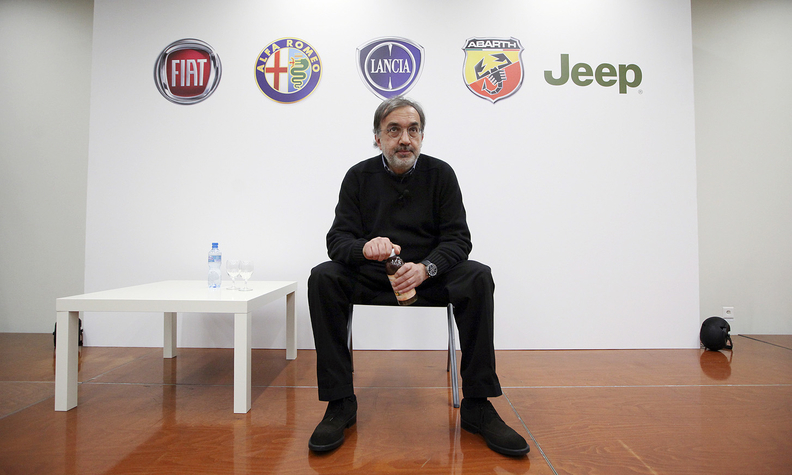 "I know that this has generated some doubts," Marchionne said. "I've never stopped watching over Fiat, and I have no intention of doing so." Marchionne brought Chrysler back to profit after rescuing the company from bankruptcy in 2009. Including the U.S. carmaker, Fiat's profit was 737 million euros. Without its 58.5 percent stake in Chrysler, Fiat would have posted a loss of 519 million euros in the first half, burdened by losses in Europe. "In 2004, we saved Fiat from extinction," Marchionne said in a Sept. 24 speech in Turin, referring to the carmaker's near bankruptcy. "In 2009, we did it again with Chrysler, giving it new life and success, and we are trying to do it again, in our country now: proposing a credible alternative to job cuts and plant closures." That alternative, Marchionne says, is to export cars to North America and other markets from Italy. To conserve cash and improve results during the downturn, which he expects to continue until at least 2014, Fiat cut European investment by 500 million euros this year. Critics in Italy say the plan risks weakening Fiat over the long term. "We should listen less to these off-the-cuff Fiat people who want to tell us why Italy is not good for building cars," Diego Della Valle, CEO of the shoemaker Tod's S.p.A. and a board member of Fiat's Ferrari supercar unit, said in a Sept. 24 speech at Milan's Bocconi University. "It would be better to worry about the future of Fiat workers in Italy." The Fabbrica Italia plan called for boosting production in Italy to 1.4 million cars by 2014, a goal Fiat almost certainly won't meet. Last year, Fiat cut its output in the country to less than 500,000 vehicles from 650,000 in 2009, and this year sales in Italy are on pace to fall to their lowest level in more than 30 years. "Marchionne promised things in Italy that he wasn't able to deliver," said Giorgio Airaudo, head of the auto workers' unit of Fiom Cgil, Italy's biggest union, which has filed dozens of suits against Fiat for anti-union activity. If Marchionne "makes wrong assessments, he can't blame destiny. He must admit mistakes." Fiat's austerity plan, which includes firing 20 percent of its managers in Europe, helped the Italian carmaker narrow first-half losses in the region to 354 million euros from 516 million euros a year ago. By keeping a tight rein on costs, Fiat will probably break even in Europe by 2014, even as rivals continue to lose money, Goldman Sachs predicts. "Sometimes to get the medicine in the patient, you have to do so at the end of a needle," said Dan Gilbert, Chairman of Detroit-based Quicken Loans and Rock Ventures LLC, which began leasing office space to Chrysler in Detroit this year. "He's putting the needle in and they don't like it." The hard line Marchionne has taken in the region, where he's been lobbying for industrywide capacity cuts, has helped drive Fiat's shares up by 25 percent this year, outpacing the 22 percent gain in the Euro Stoxx autos and parts index. "Marchionne is not Beelzebub," said Gianluca Spina, president of Milan Polytechnic's business school. "Italians should remember that he managed to turn around Fiat, which was on the edge of bankruptcy when he took the job."